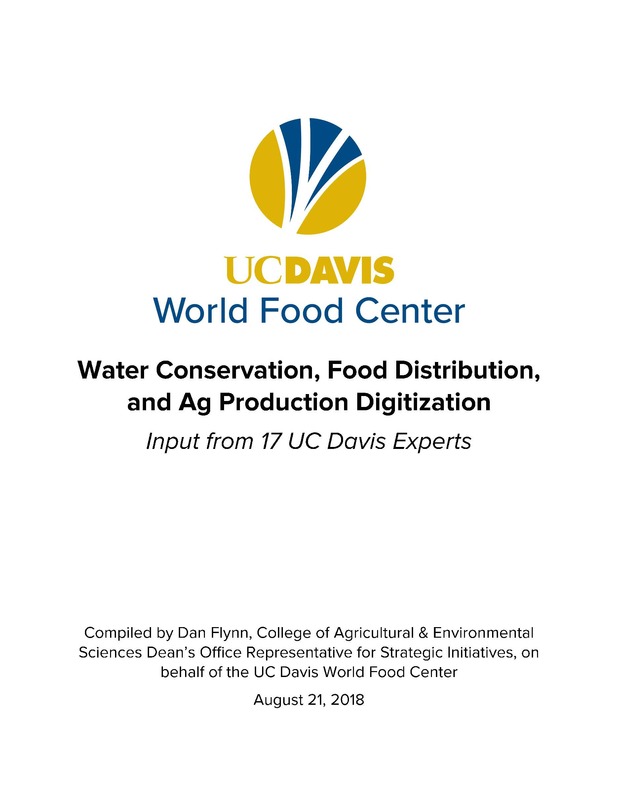 August 21, 2018 | This white paper brought together 17 UC Davis experts in the fields of water conservation, food distribution, and ag production digitization to assess and summarize their views on emerging early-stage technologies and challenges and opportunities for startups. Irrigation systems, dry and cold chains for food storage and distribution, pathogen sensors, harvest robotics, anaerobic digesters, and genomics are just a few of the many agtech topics discussed in this white paper. Through a series of interviews, readers can learn about the current state of agtech throughout the food-water-energy nexus and review detailed analyses on existing and future solutions from UC Davis faculty. July 7, 2018 | On June 2-3, 2017, the UC Davis World Food Center, in collaboration with the Program in International and Community Nutrition and the Horticulture Innovation Lab, convened a group of stakeholders to provide guidance to increase nutrient-dense fruit and vegetable consumption and offer consensus on research gaps that could improve program and implementation effectiveness. This paper summarizes the main points from the conference, “Aligning the Food System to Meet Dietary Needs: Fruits and Vegetables,” with the intent of continuing the dialogue and momentum for greater investment in fruits and vegetables from both the nutrition and agriculture sectors.